WHAT IS SPREAD THE WORD? Over 4 billion people have never discovered a personal relationship with Christ. Nearly 3 billion have never even heard the name of Jesus. Every week over 1 million people die-the majority of whom have never heard of Jesus’ sacrifice for them. Goal: Spread the Word is a North American missions avenue to enable youth to spread the Kingdom around the globe through financial giving. This could also include special projects with youth emphasis, such as youth centers etc., or other ministries that are having an enormous impact on world evangelism. Members of the YMT (Youth Ministry Team) of the Church of God wanted to create a lifestyle of tithing and giving within the culture of teenagers in the United States and Canada, and to provide teenagers with opportunities to support the evangelistic efforts and resourcing of Church of God missionaries and missions organizations on the field. At IYC Denver in 2001, Spread the Word was launched with a record offering of over $100,000. In addition to IYC offerings, state and local youth ministries have continued to give through various projects each year. In the first ten years of STW, over $500,000 was raised, and tools for evangelism were sent to more than 35 countries on 6 continents. To date, over $840,000 has been given to Spread the Word. Tools for evangelism have been sent to 37 countries, on 6 continents. Session 3: Becoming Hands, Feet and Mouths! HOW CAN YOU INCORPORATE SPREAD THE WORD INTO YOUR YOUTH MINISTRY? Take a weekly offering in your youth gathering designated for STW. Ask students to give up the cost of a cup of coffee or a meal to give to STW. Are your students going shopping for something new? Challenge them to go to a resale store to buy those special items, then give the extra money they would have spent to STW. Have your students collect spare change and send it each quarter to STW. Use piggy banks, have “Penny Wars,” or collect a mile of pennies. Give students opportunities to make donations to STW in honor or in memory of loved ones. Plan a fund raiser for STW—or better yet, let your students be creative in designing a fund raiser of their own. Already overwhelmed with various fund raisers for your ministry? 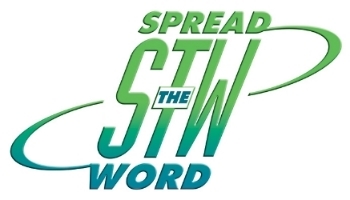 Consider tithing 10% of your profits to STW.